Recently, Nora Oswald tweeted me to ask if I had compiled a list of my favorite brain teasers. Over my years of blogging, I've written many a post about brain teasers that I love. Today, I'm setting out to compile these posts to make them easier to find on my blog. The International Math Salute was created by James Tanton, and I learned of its existence for the first time while participating in the Tulsa Math Teachers' Circle. If you've never heard of a math teachers' circle, I highly recommend that you check out this link and search for a circle near you. My husband and I participate in one and LOVE it! I've blogged about the International Math Salute here. Following that link will show you a YouTube video by James Tanton that walks you through the exercise yourself. I don't want to give anything away because that would ruin all the fun. But, I will tell you why I love this brain teaser. The first thing I love about it is that it gets you up out of your seat. Most brain teasers are paper and pencil type affairs, but this is a kinesthetic brain teaser! The other thing I love about this brain teaser is that it teaches the importance of approaching a problem backwards. That's all I'm going to say. You'll have to click here to learn more and try it out yourself! This is a brainteaser that I found online. The site I found it on referred to it as a "Square Puzzle," but I like to call it the 1-4-5 Square Challenge. I've blogged about it before here. Students are given a set of 5 pieces in a small ziplock bag. Then, students are issued three, sequential challenges . Challenge 1: Make a square using exactly one of the pieces. Challenge 2 :Make a square using exactly four of the pieces. Challenge 3: Make a square using all five of the pieces. It's important to emphasize to students that none of the pieces may overlap. Otherwise, they'll just take the extra piece from Challenge 2 and lay it on top and claim that they've figured out Challenge 3. I say this from experience because Challenge 3 is TRICKY, and students get desperate QUICKLY! I love this brainteaser because everyone can figure out the first challenge, most people can figure out the second challenge, and the third challenge is most definitely a challenge! Whenever I've used this with kids, they never want to put up the pieces if they haven't figured out the third challenge. You can find the template to cut out these pieces for your students (or yourself!) here. I laminate the pieces for the durability that will allow them to challenge students for years to come. The next brain teaser I love is called Make it Even. 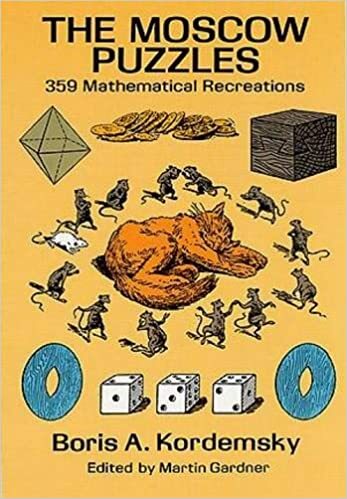 It's taken from The Moscow Puzzles: 359 Mathematical Recreations by Boris A. Kordemsky. 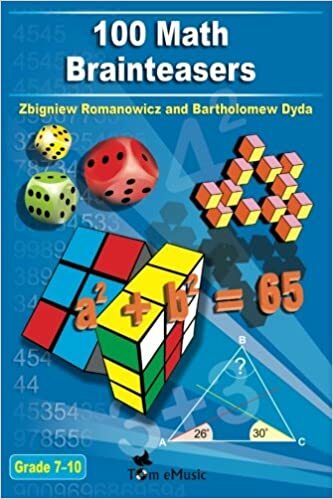 This book is a great resource for finding brain teasers and puzzles to use in the classroom. It's published by Dover, and it's usually SUPER-cheap on Amazon! I've presented it to students in two different formats. The first format asks them to use bingo chips. My school bought me a huge bag of bingo chips, and I've used them for so many activities in my classroom! There is always a bit of confusion with this puzzle. When it says to leave an "even number of bingo chips in each row and column," it means even as in "not odd." If you try to interpret even as in "the same", it won't work out for you! I recommend printing this puzzle and placing it inside of a dry erase pocket to make it reusable for all of your classes. You can find these super cheap on Amazon by searching for "shop ticket holders." They turn any activity into a dry-erase activity. This means you can make less copies and use the same set of copies year after year! My favorite dry erase markers to use with students are these pen style dry erase markers that are made by Universal. If you shop around and price check with other sites (I've often found them the cheapest at Shoplet or Zerbee), you can get them for around $2.00/dozen! You can read a more in-depth blog post about this brain teaser here. This is the type of brain teaser that once you learn you will NEVER forget! I first learned about this brain teaser from Annie Forest who has an awesome blog that you should definitely check out! Here's a link to her blog post that mentions Petals Around the Rose. 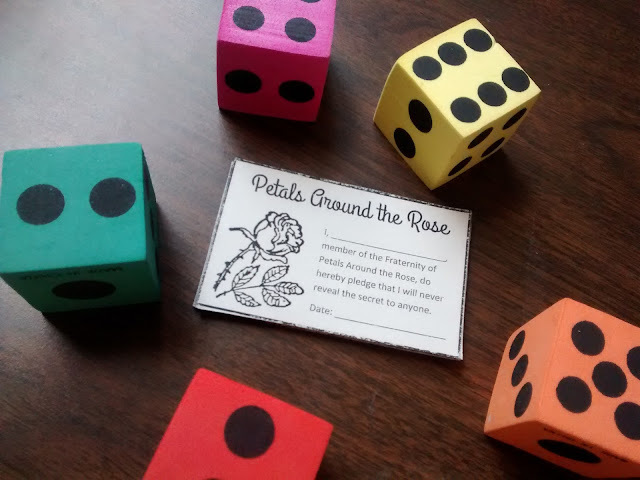 Petals Around the Rose is a game with the most simple of rules. The rules are as follows: I will roll 5 dice. You will tell me how many petals are around the rose. The name of the game is important. When people ask for more details, just repeat "The name of the game is important." This especially drives them crazy! Never played before? I recommend this online version. It will roll the five dice for you, allow you to guess how many petals are around the rose, and will tell you the correct answer. I learned to play the game by playing this version. My husband did, too! We've both used it with our students with great success. 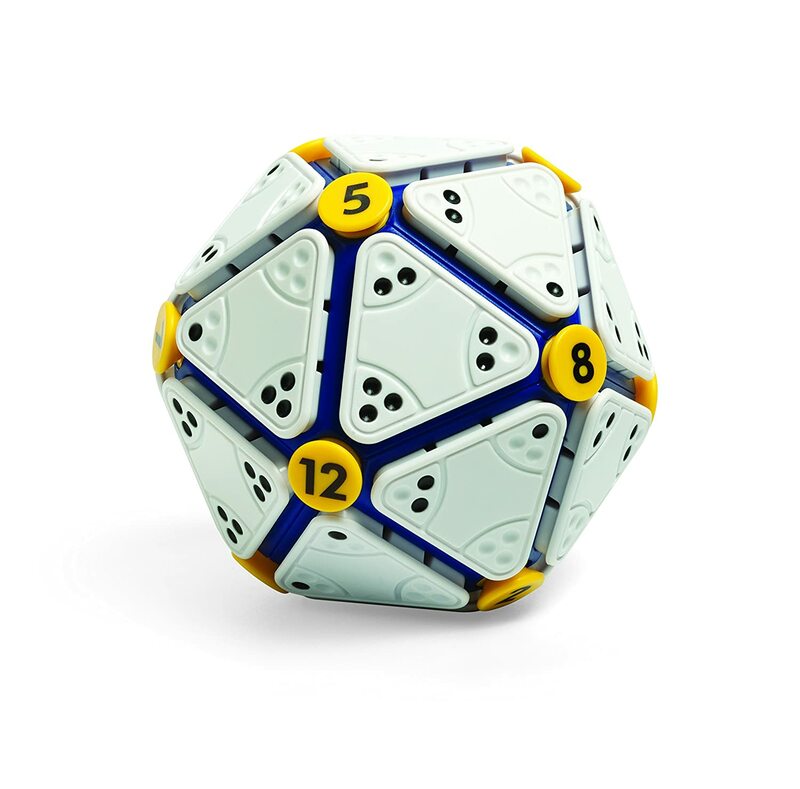 I often use the multiple dice feature on the SMARTBoard to project five dice on the screen for this activity. When students have figured out the secret, I give them a card granting the membership in the Fraternity of Petals Around the Rose. They must sign a pledge stating that they will never reveal the secret to anyone. You can find the resources I have created for Petals Around the Rose here. 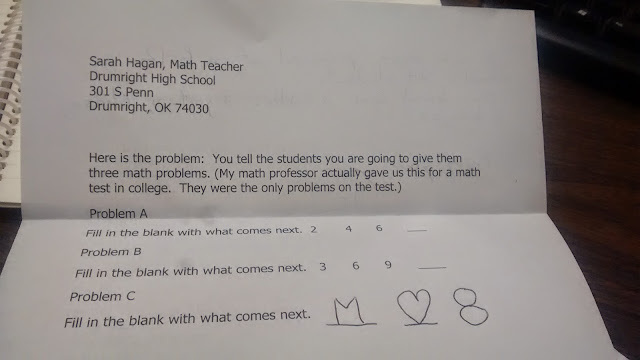 This brain teaser was actually mailed to me at school by a blog reader! 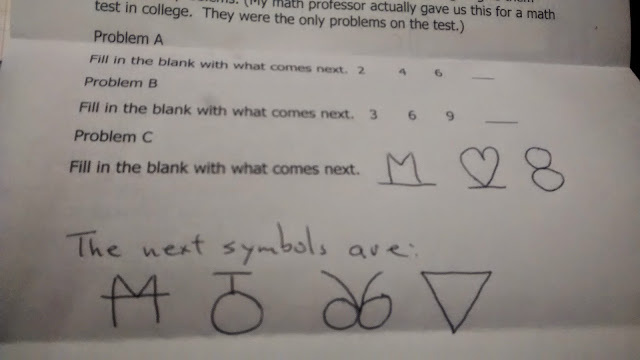 After students have had time to think about what comes next after these three symbols, ask them if they want you to share the next symbol as a sort of hint. If they say yes, share another symbol. If they becomed stumped, offer to share another symbol. In all honesty, I did not figure out this brain teaser myself. After pondering it for weeks, I tweeted a picture of it with a note that said "No spoilers, please." Someone didn't read my note and replied to the tweet with the secret of the puzzle. Now that I do know the answer, I'm not sure that I would have ever figured it out myself. Once you figure it out (or have it spoiled by someone else), it's impossible not to see. I've blogged more about this brain teaser here. This next brain teaser is one I learned while completing my Master's in Curriculum and Instruction through the University of Texas at Arlington. It was included in one of our courses as a demonstration of how to think through a problem critically. * I'm going to tell you about things I like and things I don't like. * These have nothing to do with my actual personal preferences. My likes and dislikes are determined by a rule that you must discover. * When you think you have figured out the rule, don't tell me (or the class) the rule. Instead, give me a sentence of something I would like and dislike. I will tell you if I agree or disagree. I like jelly, but I don't like jam. I like yellow, but I don't like blue. I like dresses, but I don't like skirts. I like food, but I don't like eating. I like pillows, but I don't like cushions. I like carrots, but I don't like squash. I like football, but I don't like sports. I like summer, but I don't like spring. I like yelling, but I don't like screaming. I like butter, but I don't like margarine. I like cookies, but I don't like cake. I like hoodies, but I don't like sweaters. Figured it out yet? I've blogged more about this brain teaser here. I remember being totally stumped the first time I saw this puzzle. It's the type of puzzle that makes you groan as soon as you figure it out! 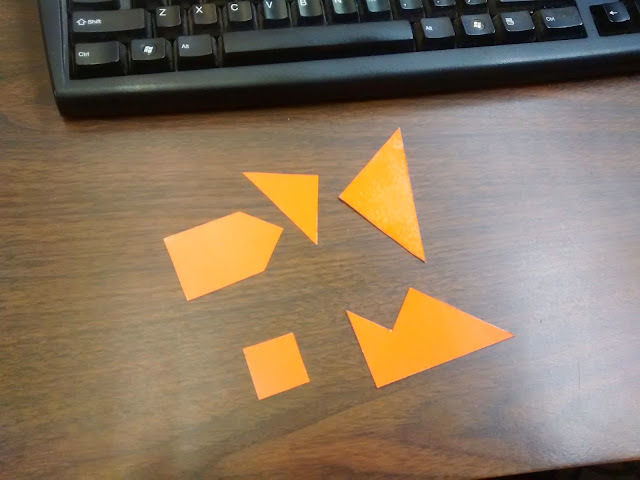 This brain teaser is a breeze to throw together if you have access to a class set of tangrams. I bought a class set a few years ago on Amazon, and they've turned out to be an awesome resource in my classroom! Give each student a set of tangrams and instruct them to use all 7 pieces to make a square. It's definitely trickier than it sounds! To extend this activity, ask students to write a paragraph describing how to assemble the pieces into a square. Once they have written their explanation, follow it while intentionally looking for ways to not make a square based on what they have written. For example, if they say to set one piece "on top of" another piece, follow what they said literally. This emphasizes the importance of being very precise in our mathematical writing. 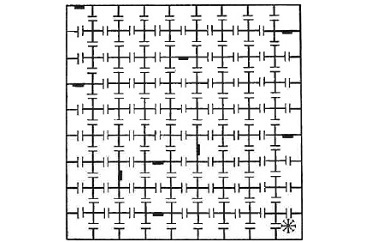 This puzzle is another favorite from The Moscow Puzzles: 359 Mathematical Recreations by Boris A. Kordemsky. You can also find the puzzle online at NCTM Illuminations. Here's the text of the puzzle: A prisoner was thrown into a medieval dungeon with 145 doors. Nine, shown by black bars, are locked, but each one will open if before you reach it you pass through exactly 8 open doors. You don’t have to go through every open door but you do have to go through every cell and all 9 locked doors. If you enter a cell or go through a door a second time, the doors clang shut, trapping you. The prisoner (in the lower right corner cell) had a drawing of the dungeon. He thought a long time before he set out. He went through all the locked doors and escaped through the last, upper left corner one. This is a brain teaser that I was first introduced to by a book I was reading. 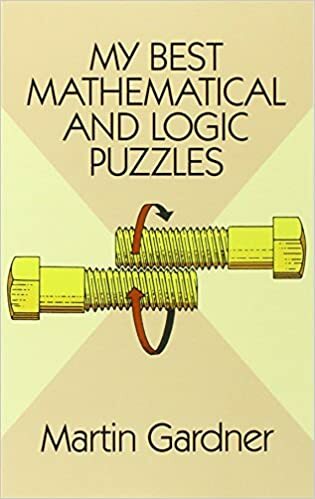 I read the puzzle, puzzled over it for a few minutes, considered looking up the answer in the back of the book, and decided against it. A few weeks ago, Fawn mentioned that this puzzle was one of her favorites on Twitter. I commented saying that I had never been able to figure it out. She recommended that I give it another try. I did, and this time I was able to figure it out! During a recent census, a man told the census taker that he had three children. When asked their ages, he replied, "The product of their ages is 72. The sum of their ages is the same as my house number." The census taker ran to the door and looked at the house number. "I still can't tell," she complained. The man replied, "Oh that's right, I forgot to tell you that the oldest one likes chocolate pudding." The census taker promptly wrote down the ages of the 3 children. How old are they? I used to think this puzzle was impossible, but I promise it's not. I'm not going to link to a solution because I think you should try to figure it out for yourself! Some research online says that the original riddle should be attributed to George Polya. 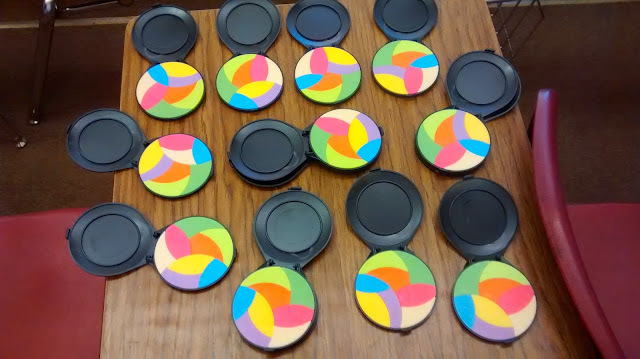 My mom found a set of IQ circles at a thrift store several years ago, and they have provided a lot of frustration in my classroom over the years! The box that each puzzles comes in claims that there are at least 10 ways to arrange the pieces so that they form a complete circle. I know I even have trouble putting these together! When students start a puzzle and can't finish it, I often have to "cheat" and look at the solution on the box. You can purchase these from different party favor retailers. Here's one site I found online that offers them. I love presenting my students with this interactive frog jumping puzzle that I found online here. Each frog can only jump the way it is facing. And, frogs can only jump over frogs of the opposite color. The goal of the puzzle is to make the frogs switch sides. I give different a students a turn at the SMARTBoard because tapping on a frog will make it jump. My husband used his coding skills this summer to make his own interactive version of this puzzle that lets you change the number of frogs in the puzzle. I have only used this puzzle as a fun brain teaser, but my husband has taken it and turned it into a full-blown algebra lesson. You can find out more about his interactive version here. And, here is a post where he describes what happens when he used the puzzle with his students. The Tower of Hanoi is a brain teaser I was first introduced to in one of my math classes while completing my math major. I got the chance to revisit it in a graduate class while studying curriculum and instruction. You can find online applets like this that allow you to complete the puzzle. It's a great puzzle to have students play for fun. Then, have them generalize how many moves are required to move the tower based on the number of disks in the tower. When they are playing for fun, they probably won't even realize the math behind what they are doing, so it's up to us to show them how math-y the puzzle actually is. 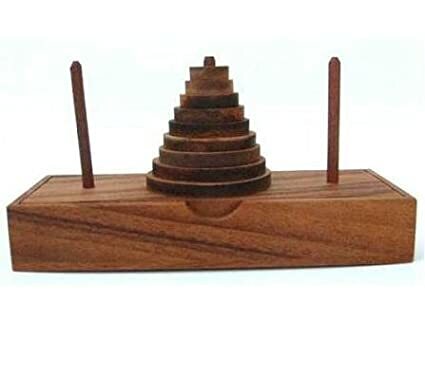 You can also pick up a wooden Tower of Hanoi set for your classroom from Amazon. I don't have one of these yet, but it is SO tempting! Here are some brain teasers that I would recommend for purchase. I received this tricky puzzle as a birthday present from my sister. The game features cards with 48 different levels on them. 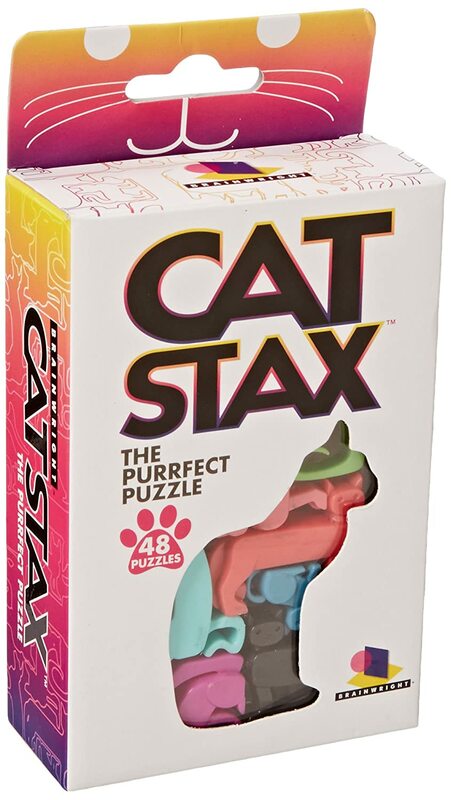 You finish a level by covering the puzzle card with the specified colored cats. It is a game that definitely makes your brain hurt! When Shaun's family was in Australia for our wedding, this puzzle ended up getting a lot of use! This puzzle was also a gift from my lovely sister. She loves to buy me puzzles that make me want to rip my hair out! To complete this puzzle, you have to remove all of the white pieces. Then, arrange the yellow, numbered pieces on the puzzle in any way that you wish. Once the yellow pieces are in place, snap the white pieces back in the puzzle so that the number of dots that meet at each vertex add up to the number at that vertex. I found this puzzle to be nearly impossible, but I've let others play with it and they've been able to figure it out quite quickly. It's definitely a brain-stretcher! 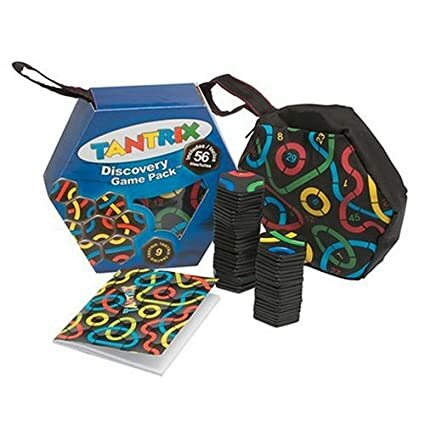 Tantrix is a brainteaser type puzzle that I was introduced to for the first time when I was in Australia. Shaun and I visited another couple's house for dinner, and this game was pulled out to be played. This game requires you to make closed loops of different colors, and I found it to be a real challenge! Shaun and I worked through some of the puzzles, and he was doing most of the puzzle solving. This meant that the levels quickly became too hard for me since I hadn't quite wrapped my mind around the puzzle yet. I think if I slowed down and attempted it at my own pace that I'd be a lot more successful. 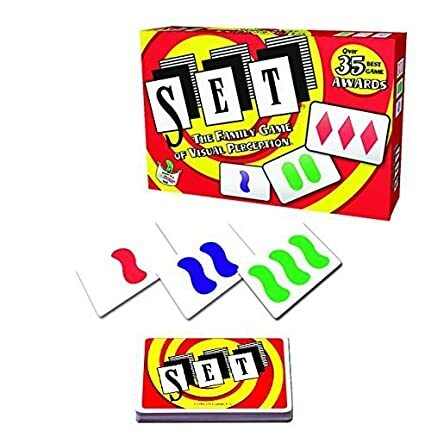 Set is a puzzle game that I had heard a lot about, but I never actually had a chance to play until I started attending the Tulsa Math Teachers' Circle. It's a puzzle that was very hard for me to understand at first. Luckily, I was paired up with some amazing math teachers who were very patient with me and let me reason through the puzzle at my own pace without giving away the answer. It's a game that you can play by yourself as a brain teaser or with a group for some competitive fun. My favorite way to introduce my students to this game is to have them work through the online tutorial on the SET game's website. If you don't have access to sets of SET cards for students to play with, there are two daily online SET challenges that I definitely recommend for classroom use. The first version is on the game publisher's website. You are provided with a set of 12 cards that contain 6 different SETs to find. A different set of 12 cards is posted daily. The game is interactive and perfect for use on your interactive whiteboard. I find that this version of the game can be too tricky for beginning set players. The New York Times also has a daily set game on their website that is broken into 4 different levels. Given that I own the regular SET game, the mini SET game, and the SET Dice game, you can probably tell that I LOVE SET! 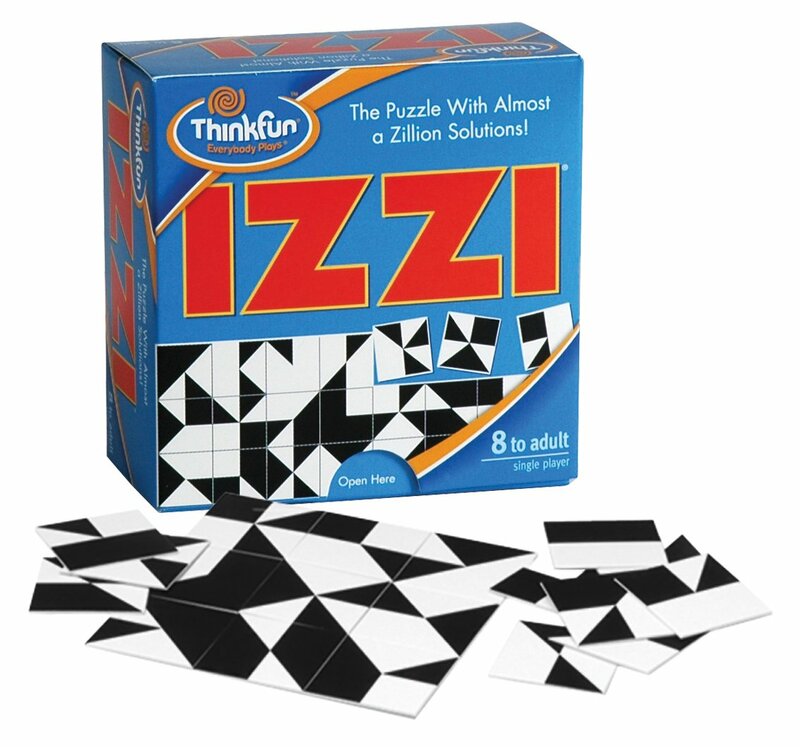 Izzi is another brain teaser game that I received as a gift. It's a puzzle that claims to have "almost a zillion solutions." It's for ages 8 to adult, and I can attest that it is super tricky. It's the type of puzzle that starts off easy, but the difficulty builds and builds and builds as more and more pieces are placed in the puzzle. My husband and I solved the puzzle a few weeks ago, and it was a fun evening challenge for the two of us. You have to line up all the puzzle pieces so that black edges are touching black edges and white edges are touching white edges. Sounds simple, right? It is, but then it isn't. If you love brain teasers and logic style games, I need to tell you about a must-see site! ThinkFun is a game publisher that creates so many awesome math-y games. They are the company responsible for awesome games like Swish and Math Dice. They have a page on their website dedicated to free, online versions of many of their games. I really enjoyed playing their online version of Rush Hour. ThinkFun has also created a page with printable PDFs of various brain teasers for you to download for your classroom. There are four brainteasers for Grades 1-2, four brainteasers for Grades 3-4, four brainteasers for Grades 5-6, and four brainteasers for Grades 7-8. On top of that, they have a page with printable 2-player strategy games in PDF form that you can print and use with your students. They have so many other resources for teachers that I can't even list them all here. Check out this link! Interestingly, the Follow the Pattern one that was mailed to you was easy for me to figure out, but the Petals Around the Rose one took me FOREVER! I find it fascinating to see how different people's brains work and the types of puzzles they are good or not as good at. 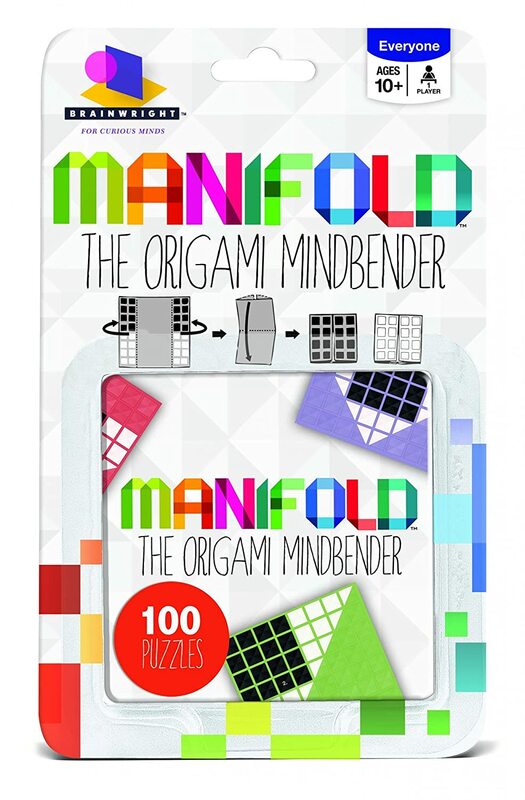 Wow so many fun and useful puzzlers...Thanks!